Published on May 16, 2018 at 10:00 pm . Winnipeg, Manitoba, May 17, 2018 — The Tri-Hospital Dream Lottery is well underway, and the first early deadline – the $30,000 Loyalty Bonus Deadline – is Midnight, Tomorrow (Friday)! Order your tickets by Friday and you’ll be automatically entered into all of this year’s biggest draws – that includes the Loyalty Bonus draw, the Dream Bonus draw, the 26 Early Bird draws (worth over $175,000), and the Grand Prize draw, of course. This year’s Grand Prize options include — for the first time ever — beautiful, desirable lakefront cottage in Whiteshell Provincial Park, on Dorothy Lake (by CCM Design Built), a Maric Home in Winnipeg’s South Pointe neighbourhood, an Irwin Home in South Headingley, a luxury condo in Winnipeg (along the Red River in North Kildonan), or $1.2 million tax-free cash. All of last year’s biggest Tri-Hospital Dream Lottery winners bought early… if you buy today, you’re in to win all this year’s biggest prizes as well, including the $1.52 million Grand Prize draw! 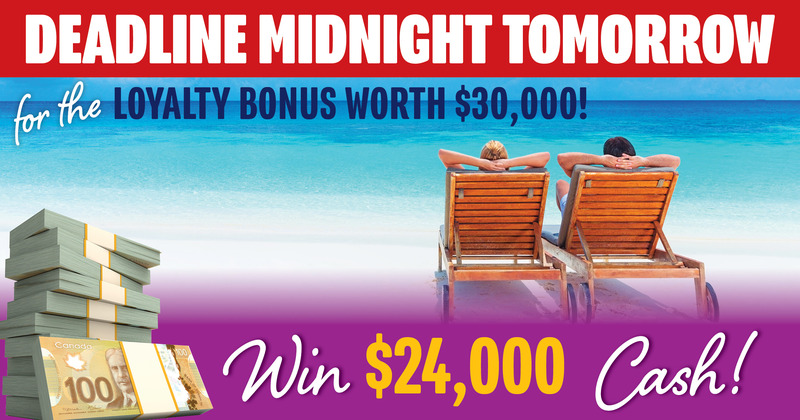 And there are even more ways to win, two extra games to play this year – the 50/50 PLUS and the Daily Cash Calendar. The 50/50 PLUS jackpot could grow to $1,755,000, and the winner takes half… it’s like a second Grand Prize for just $15 a ticket! The Daily Cash Calendar is our special third game, and tickets start at just $20 to play. There are 31 days of winning, with two new all-cash winners every day – that’s 62 winners for a month, with 52 $1,000 cash winners, eight $3,000 cash winners, and two Final Draw winners of $25,000 cash each. For a full list of prizes, visit TriHospitalDream.com – and don’t forget to check out the homes’ Photo Galleries and Virtual Tours. You can also see the homes in South Pointe (Winnipeg) and Headingley in-person. The Tri-Hospital Dream Lottery benefits Manitoba’s three biggest hospitals – St. Boniface Hospital, Health Sciences Centre, and Children’s Hospital – HSC Winnipeg. Each year, hundreds of thousands of Manitobans depend on these hospitals to be there in their times of greatest need. St. Boniface, HSC, and Children’s hospitals serve almost 1 million patients annually and help deliver more than 11,000 babies each year. “With our three hospital foundations working together, we can achieve more for the greater good – delivering the best possible patient care,” says Gary Rozak, Interim President and CEO of Children’s Hospital Foundation of Manitoba. “Patients like our Champion Child Abigail, who at only age four needed a very high level of specialized equipment as she fought a disease that caused her white blood cells to eat away at her bones. This is the Tri-Hospital Dream Lottery’s third year, since all three hospitals came together to team up in 2016.